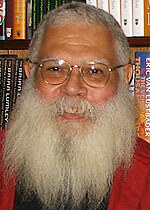 Samuel R. Delany is the author of numerous science fiction books including, Dhalgren and The Mad Man, as well as the best-selling nonfiction study Times Square Red, Times Square Blue. He lives in New York City and teaches at Temple University. The Lambda Book Report chose Delany as one of the fifty most significant men and women of the past hundred years to change our concept of gayness, and he is a recipient of the William Whitehead Memorial Award for a lifetime's contribution to lesbian and gay literature.